THANKS TO BRENDA PANDOS FOR THE REVIEW COPY. In YA one creature that doesn't get a lot of fame is the mermaid. The only books I had read about mermaids before Everblue were a long time ago, and most of them were at a middle grade level. So, needless to say, I was intrigued by the idea of reading a YA novel on them. My favorite part of this cover is that it is so bold. The red of the cover model's hair with the blue of the starfish. Put that alongside the cool font of the title and the blue of the title and together they all work very well. The other aspect of the cover that I found interesting was the line "She wanted her life to change... he wanted his to stay the same.". This line provoked so much curiosity when I read it, after reading that one line, I wanted to read the book. I just adore how the entire cover came together so nicely! 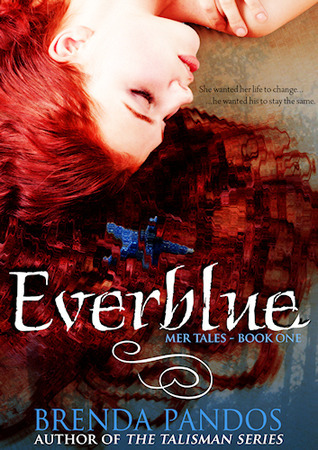 The writing of Everblue was one of my favorite aspects of the book. Just how effectively it enticed the reader and caught their attention. It was able to hold the reader the entire book, never catching in places or getting slow in others. The other part of the writing that I found interesting was that the story was set in two different points of view. Often I don't care for multiple points of view because it can get a little confusing at times or I'll favour one character over the other's point of view. I can honestly say this was one of the best books I've read that was set in multiple points of view because not only did it flow well, but it also never confused the reader as to what each character knew and the other didn't. It also told the story beautifully so you saw both sides of the story. As I mentioned above, Everblue is set in two very different perspectives, that of Fin and Ashlyn. I fell for both of these characters and I enjoyed the forbidden love feel that the mermaid aspect gave the book. And I really liked how well these two characters went together and how despite the paranormal aspect, they still went through what average high school students do. As for the characters themselves, I really enjoyed reading about them. I found Ashlyn to be relateable and she had a realistic point of view on the world. And Fin was that perfectly mysterious guy that you just want to know more about. At times I felt he was a little selfish, but apart from that I had no issues with him. Overall, Everblue had a lot going for it with few drawbacks. I would definitely recomend this book to anyone who likes forbidden love, mermaids or just anyone who wants a great read! I cannot wait for the second book to come out so I can see what is going to happen to the characters after that cliffhanger ending. For being so enjoyable and gripping, I give Everblue a 5/5 without question. I cannot WAIT to get my hands on this one!! I totally agree with you-- this is one of the most stunning YA covers I've seen, and there a lot of wonderful covers out there! I am so glad to learn that the story itself is just as good :D Thanks for the great review! Thanks! I loved being a part of the tour! Obsidian by Jennifer L. Armentrout Cover Reveal!